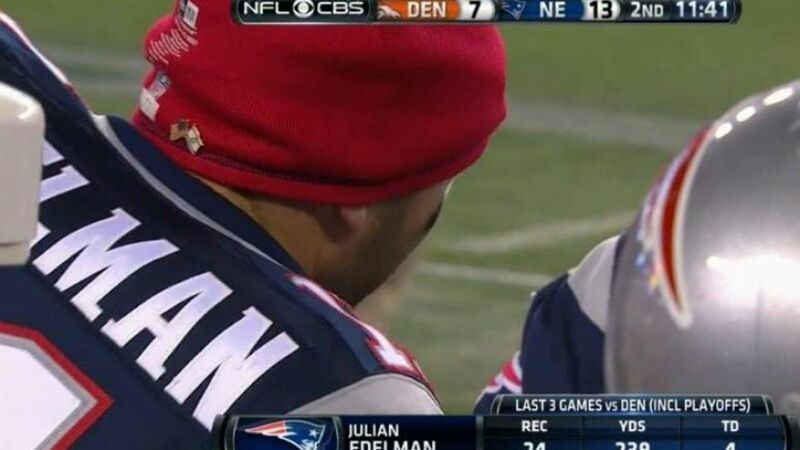 Thank you Julian Edelman. In a society where it is not particularly fashionable for people to stand up for Israel, the New England Patriots Wide Receiver is seen in this picture showing his support for Israel. Although unlikely, perhaps this will send a message to those celebrities who have been conspicuously quiet over the past few months. The NFL (National Football League) is not exactly an organization from which you expect or require a political voice, so for Edelman to make this statement, albeit subtly, shows true strength of character and conviction. With a last name like his, Edelman’s father is Jewish, we shouldn’t be that surprised, but in my opinion it’s still great to see. Nicknamed Minitron as a reference to his exceptional talent as a much smaller Wide Receiver than the superstar Receiver Calvin Johnson of the Detroit Lions, Edelman has become a favorite target of Quarterback Tom Brady over the past 2 years. Now he’s become one of my favorites as well. My one regret is not holding on to him when I had him on my fantasy football team. Sorry Julian. I thought I was getting good value in the trade. I clearly made a mistake. This entry was posted on Tuesday, November 4th, 2014 at 1:55 pm	and tagged with Calvin Johnson, Detroit Lions, Fantasy Football, Israel, Jewish, Julian Edelman, Megatron, national football league, New England Patriots, NFL, Tom Brady and posted in Uncategorized. You can follow any responses to this entry through the RSS 2.0 feed.